AK20002. 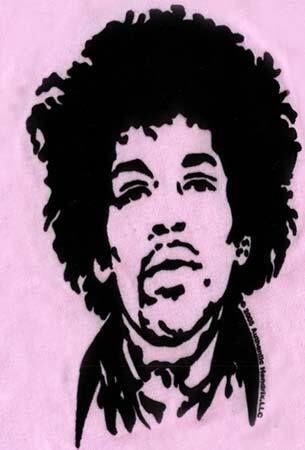 Hendrix image made of velvety black flocking on a baby pink tee. Shirt is a lightweight, 100% cotton. Measurement across the front and under the arms: Med-15", Lg-16", XL-17". Length measure down the back: Med - 22"; Lg and XL - 23". Ladies Youth/Jr sizes Med - XL. Jimi Hendrix tee printed with flocked ink.